With an ever-increasing number of IoT devices coming online every day, there is a critical need to have an easy to implement security between the physical devices and the cloud. 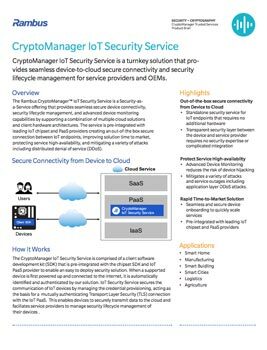 The Rambus CryptoManager IoT Security Service is a turnkey device-to-cloud security solution for IoT devices and services that covers all aspects of IoT device secure connectivity. Our solution is pre-integrated with leading cloud Platform as a Service (PaaS) providers and chipset manufacturers, creating a one-stop shop solution for OEMs and Service Providers.